The CCHS JROTC Bulldogs had its Upper Cumberland Rifle League banquet on Tuesday, January 22, 2019. CCHS walked away 3rd overall. Several cadets won individual medals: Top standing shooter – Hayden Shelton; Top new shooter – Hayden Shelton; Most improved shooters – Abby Turner and Sarah Scheffler; Top academic – Sarah Scheffler. ;MVP – Rayleigh Longwell. Congratulations to all the Rifle members on an awesome season. 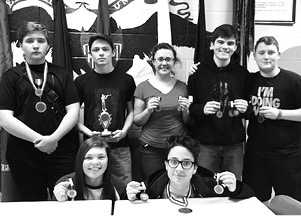 Team members shown in the above photo are, back row, left to right: Rayleigh Longwell, Devin Catron, Abby Turner, Hayden Shelton, and Eli Brown. Bottom row, from left to right, is Gabby Longwell and Sarah Scheffler.